The preschool years are a time of huge change in children’s cognitive abilities and yet very little is known is known about the corresponding changes in brain function. 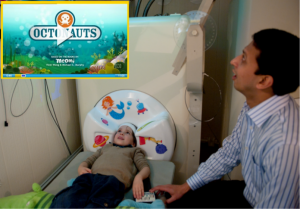 Using Macquarie University’s worlds-first child-optimised magnetoencephalography (MEG), this ARC funded project led by Associate Professor Paul Sowman with his team including Dr. Wei He, Dr. Nick Benikos and Hannah Rapaport have successfully completed the first phase of data collection with eighty-four young children and their families’ visiting the lab to undergo astronaut training (MEG testing). This is the first investigation that will longitudinally track the changes in young children’s auditory function as they grow older; providing much needed insight into typical brain development and will provide an important first step towards understanding neurodevelopmental disorders such as autism. The project is now moving in phase 2 and looking for new ‘intrepid’ astronauts to participate in the research.